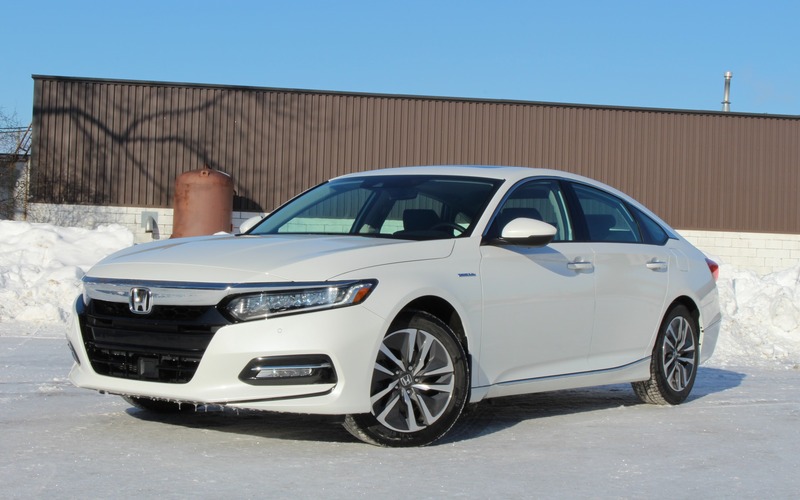 The Car GuideTests and FeaturesTest Drives2018 Honda Accord Hybrid: The Best Accord? 2018 Honda Accord Hybrid: The Best Accord? Redesigned for the 2018 model year, the Accord sedan has been largely well received by the automotive press, and picked up several awards over the course of the year. We at The Car Guide have proclaimed it a Best Buy in the midsize sedan category in 2018 and in 2019, beating out its arch-rival Toyota Camry by a very slim margin. It also won AJAC’s 2018 Canadian Car of the Year award and the 2018 North American Car of the Year title as well. While the Accord can be chosen in a variety of trim levels, including a performance-oriented Sport 2.0 variant that benefits from a turbocharged, 2.0-litre four-cylinder engine with 252 horsepower, we think most buyers in this market segment are more interested in ride comfort, interior space and fuel economy. The 2018 Honda Accord Hybrid scores on all those aspects. It’s equipped with an Atkinson-cycle 2.0-litre four-cylinder engine and two electric motors, which sends power to the front wheels. This powertrain produces a combined 212 horsepower, while the main electric motor develops 232 pound-feet of torque. There’s no conventional automatic transmission here, just an electronically controlled system that couples and decouples the gas engine to the drivetrain. That’s enough to quickly propel the Accord Hybrid up to speed, in relative silence, except when we mash the accelerator to the floor for merging onto the highway. In that case, as the engine can get a little noisy. As we drive along, the hybrid system shuts off the gasoline engine and turns in back on again, maximizing the use of the electric motor, which in turn lowers fuel consumption. We can also move along in full EV mode, either summoned automatically or by forcing it with the console-mounted EV button. It’s only effective over short distances and at slow speeds—limited by the lithium-ion battery’s capacity. During our winter test, we averaged 6.5 L/100 km, which is pretty good. In spring and fall when the climate control system isn’t on full blast, it’s fairly easy to match the combined city/highway rating of 5.0 L/100 km. 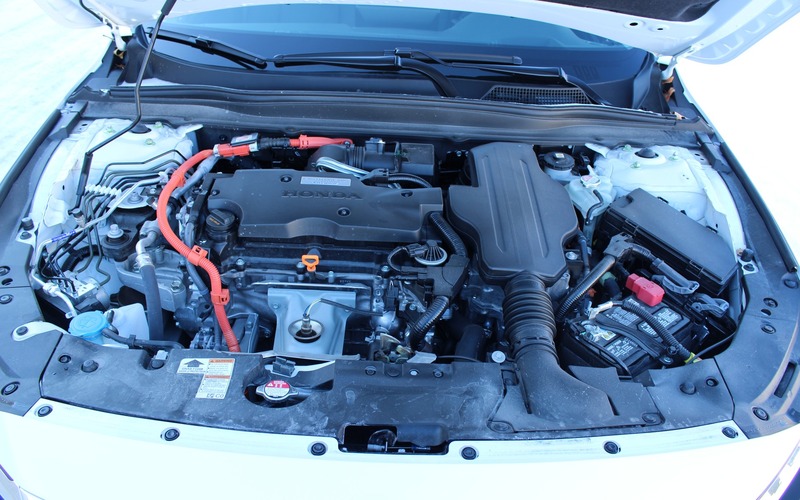 Many subcompact cars can’t do as well as the Accord Hybrid. In comparison, the Toyota Camry Hybrid’s combined rating is 4.9 L/100 km and the Chevrolet Malibu Hybrid’s is 5.1. The hybrid versions of the Ford Fusion and the Hyundai Sonata both have a combined rating of 5.6 L/100 km, while the Kia Optima Hybrid trails the midsize sedan category at 5.7 L/100 km. What’s best about this powertrain is that the transitions between gasoline and electric propulsion are seamless. Let a relative or a neighbour drive this sedan, and he or she may never notice that it’s a hybrid—given the person didn’t see the blue “hybrid” badge on the car’s front fender. On the other hand, the Accord with a base, turbocharged 1.5-litre engine is rated at 6.3 L/100 km on the highway, so if most of our daily commute is done at higher speeds, the extra $5,000 asked for the hybrid variant might not be worth it. As is the case with all versions of the 2018 Honda Accord, interior space is aplenty, even though it’s not the roomiest overall in its market segment. It does offer the most rear-seat headroom and the most shoulder room, while trunk space is class-leading at 473 litres. The Accord Hybrid includes the brand’s Display Audio System with seven-inch touchscreen, a 452-watt sound system with 10 speakers, Apple CarPlay and Android Auto integration, Near-Field Communication connectivity (for applicable devices) as well as front and rear USB ports. Said touchscreen is fairly reactive to finger contact, but the surrounding buttons to access the system’s main functions are a far reach while driving. On the other hand, the climate controls couldn’t be simpler to use. For the $33,090 entry price before adding freight and delivery charges, we also get cloth upholstery, heated front seats, a leather-wrapped steering wheel, a 12-way power driver’s seat, a windshield wiper de-icer as well as a battalion of advanced safety features such as adaptive cruise control, lane keep assist and forward collision warning with emergency braking. If we’re in the mood for a little more equipment like leather seating, ventilated front seats and heated rear seats, a heated wheel, wireless phone charging, navigation, a power sunroof and head-up display, to name a few, we can step up to the Touring trim level that retails for $39,790. Granted, the Accord is a little pricier than its hybrid midsize sedan rivals, although it does come with a few more features. That doesn’t stop us from liking the hybrid Honda—a lot. And this might be the most reliable Accord on the showroom floor right now. We’re not saying its turbocharged engines are troublesome, but the 1.5-litre engine in the CR-V and the Civic have been recently criticized for mixing fuel into its oil—which Honda Canada says can be fixed with a visit to the dealer. The Accord also has a 1.5-litre unit, although so far, the engine update isn’t necessary in this case. It’s arguably the best Accord overall, although that Camry Hybrid is also a brilliant car. We prefer the Honda, but consumers interested in a good hybrid sedan should test-drive both in order to figure out which one suits them best. 9/10	Excellent all year round, and during our winter test, we averaged 6.5 L/100 km. 8/10	Supportive seats, great ride quality. 7/10	Plenty of power for the daily grind, although the engine can get a little noisy while merging on the highway. 7/10	Not the best on the market, but a fairly easy-to-use interface and lots of features. 8/10	Good road manners for a conventional midsize sedan, with no sacrifice in ride comfort. 9/10	Arguably the best midsize sedan on the market right now, and the best Accord overall, too.